Yesterday I spent the day working at a “Cork n Pork” festival in a real small town called Sainte Marie, IL, population 243. Needless to say, the BBQ portion of the festival didn’t offer any vegan options for a hungry girl working a 17 hour day pouring wine in 95 degree heat. Luckily I never travel without food, and I had picked up a gingered tempeh pasta salad from the grocery store the night before to pack for the festival. Yeah, I was that girl. Don’t care. Anyway, the salad reminded me how fricking good tempeh is. Something about the texture is really satisfying. So I made some this evening for dinner in a sweet chili sauce with a bunch of stir-fried veggies. I hadn’t made this recipe since my first week in IL, so it was nice to go back to it. Still really like this dish. Cut the tempeh up into cubes. 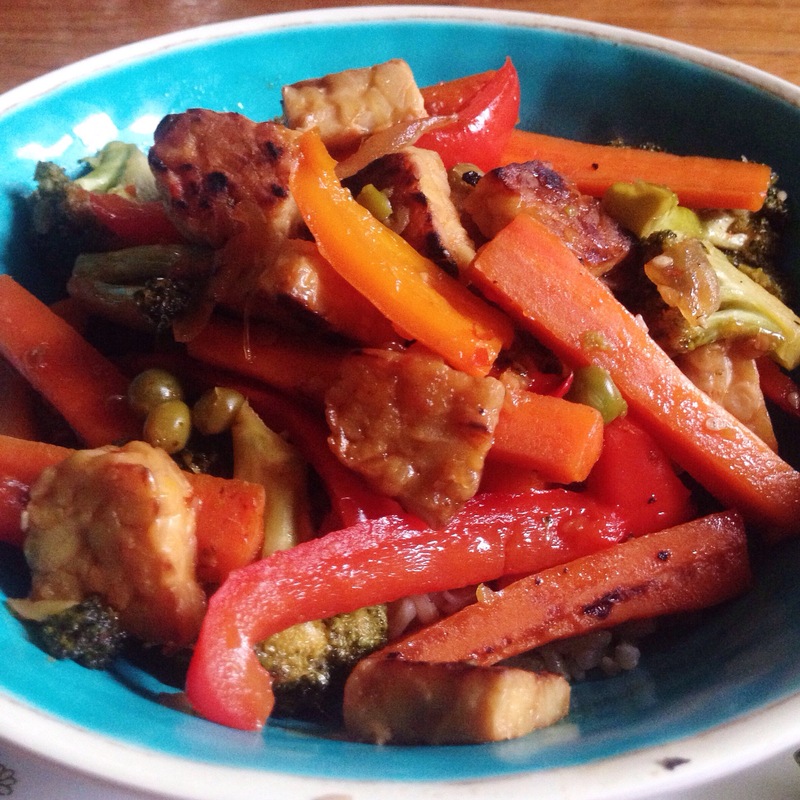 Heat some sesame oil in a wok and throw the tempeh in. Cook until both sides are golden brown, moving it around a lot. Remove from heat and set aside. Turn the stove top off. Next get your veggie prep out of the way. Chop the onion, broccoli, carrots and pepper up however you want them. I like the onion in small pieces and matchsticked carrots and peppers, but it really doesn’t matter. Add a bit more oil to the wok and heat it up again to high heat. Add the onion and cook just until fragrant, a minute or two. Add the carrots and stir-fry until they start to soften, then add the broccoli and cook for another few minutes, still stirring constantly. Add in the peppers and keep stir-frying, then throw in the frozen peas and a minced garlic clove. When the peas have thawed, add the tempeh back in. Then add the sweet chili sauce, tamari, rice vinegar and sherry. 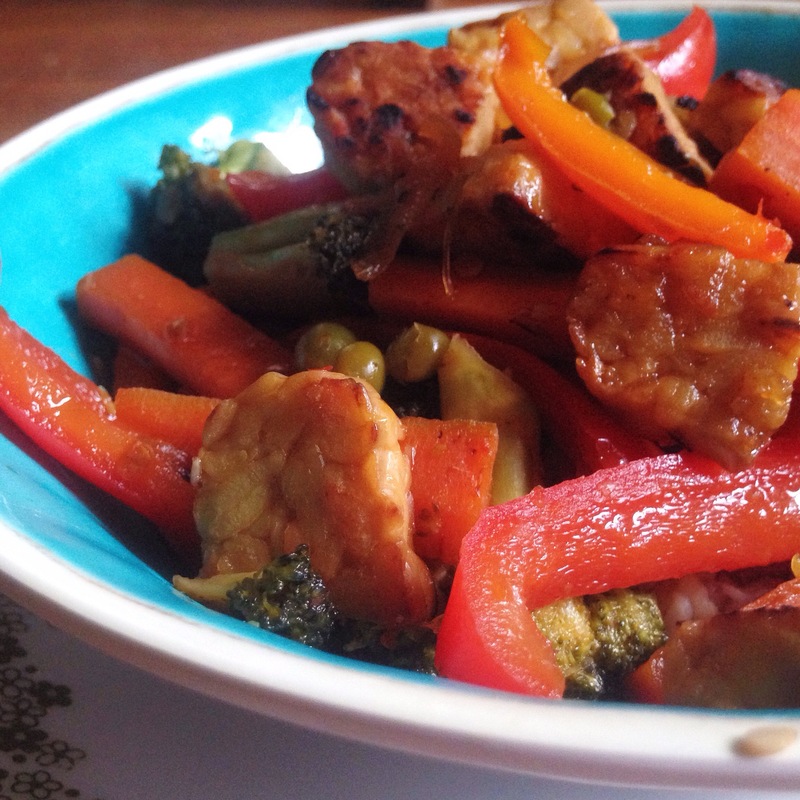 Mix it all in and stir-fry it all until the veggies are cooked through. And it’s ready! I served it over a bit of brown rice with a side of bok choy sautéed in sesame oil and sprinkled with some sesame seeds. The tempeh by itself cooked until golden in sesame oil is really good on salads or in wraps and stuff. 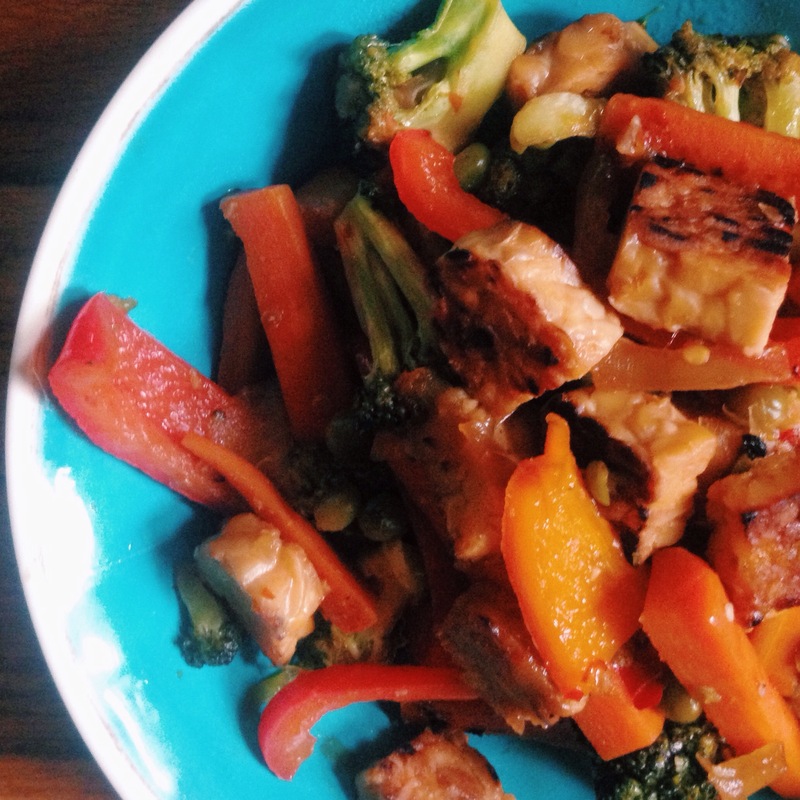 Pretty much anything you’d use cubed tofu for. There is a little bit of spice in the sweet chili sauce, but if you like more you can totally add a bit of sriracha. Oh this looks so nice, a must try thanks for sharing.